Thanksgiving is one of the Bolner family’s favorite times of year! With juicy turkey, sweet potato casserole and scrumptious pumpkin pies (recipe here), who wouldn’t like this holiday? 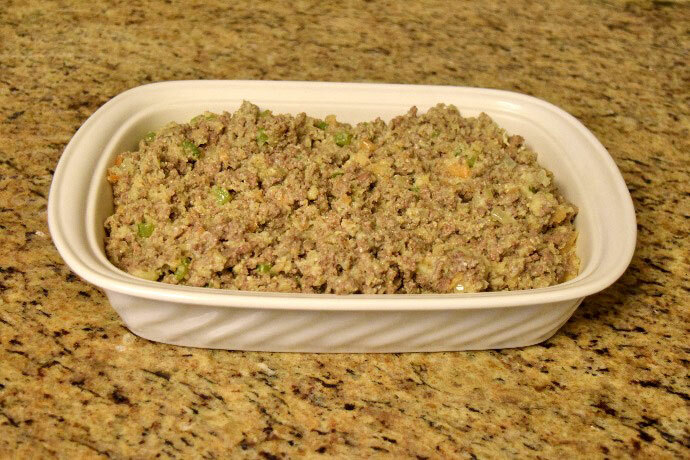 One of the family’s oldest traditions is making Grandma Bolner’s home made meat dressing! “Meat dressing”, you ask? What happened to cornbread stuffing? Well, we have that too, but nothing compares to this delicious, unique Thanksgiving treat! Easy to make, bring this tasty dish to your holiday party – you (and everyone else) will be giving thanks that you did! 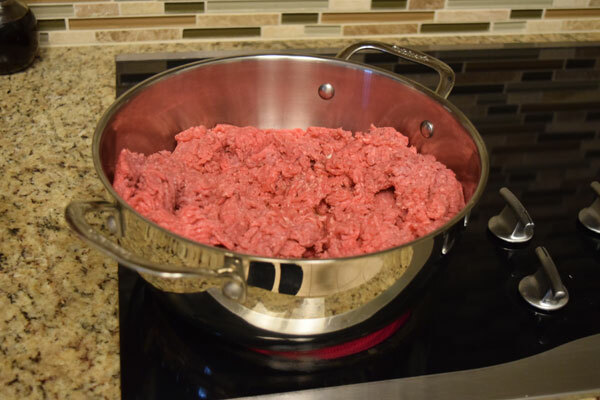 In a 5.5 quart (or larger) pot, cook together the ground beef and butter until pink is almost gone, stirring occasionally. 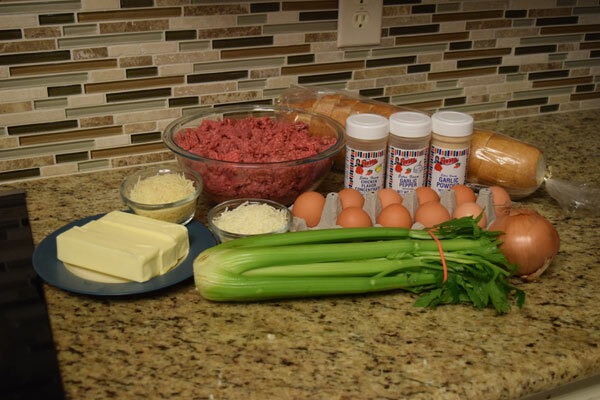 While the meat is cooking, chop up the onion and celery. Chopping Onions used to be one of my least favorite things to do – I could never get even pieces like all of the other Bolner’s could do. In the last year, I came across the most amazing trick that has yet to fail me! Cut off the top of the onion (end without the roots). Stand the onion on the flat side that you just cut off, and slice it down the middle, cutting the roots in half. Peel off the outer layer of skin. 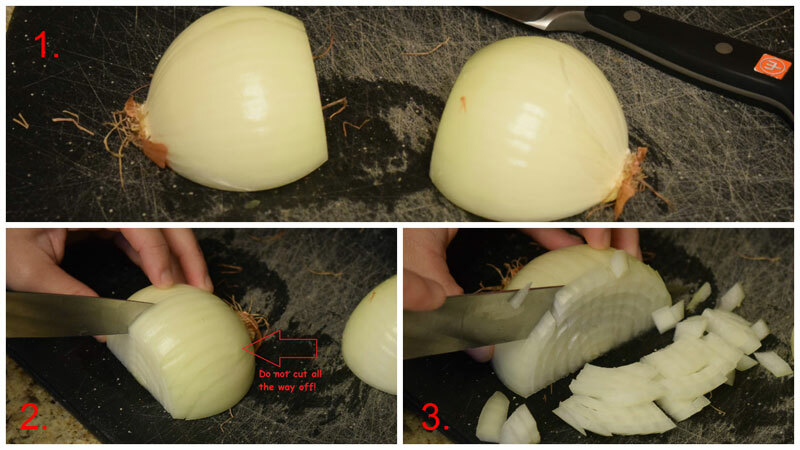 Slice the onion length wise, leaving about ½ inch attached on the root side of the onion. Once you’ve sliced the onion all the way across, lengthwise, cut the onion across the width (perpendicular to your previous cuts). This creates perfect dices of onions every time! Stir in the chopped onion and celery. If you used fresh garlic, add this in too! If not, add 2 tsp Garlic Powder (or to taste). Stir, and let simmer for about 5 minutes. Meanwhile, add enough water to the bread to moisten it, and set aside. Now comes the tricky part! 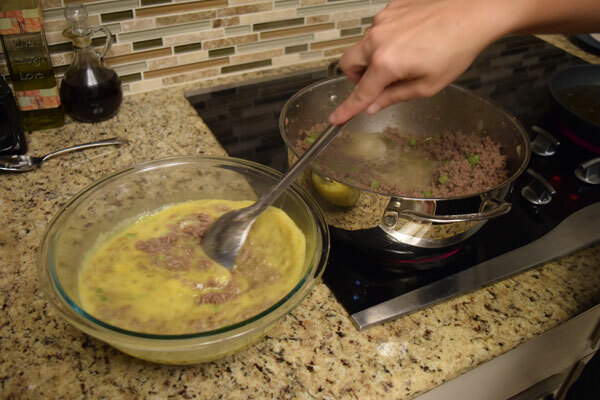 Adding the eggs directly to the pot may cause them to cook too quickly and become scrambled eggs in your meat. While this is will still taste delicious, it may not look too appealing! Instead, the eggs should be tempered (heated slowly) before adding them to the pot. There are a few ways to do this. 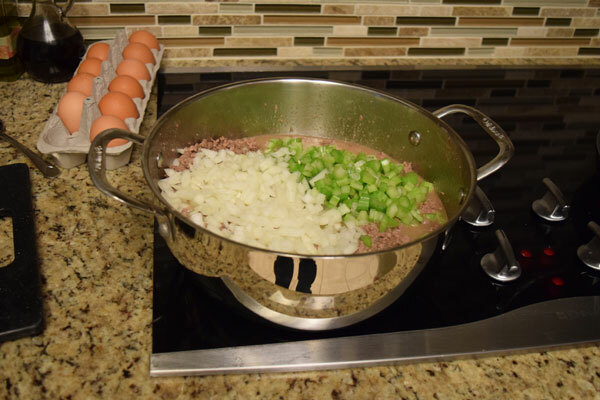 I decided to add a few spoons full of hot beef and some of the juice to my bowl of eggs, stirring continually. (At this point, I removed some of the excess liquid from the pot, but this isn’t necessary!) 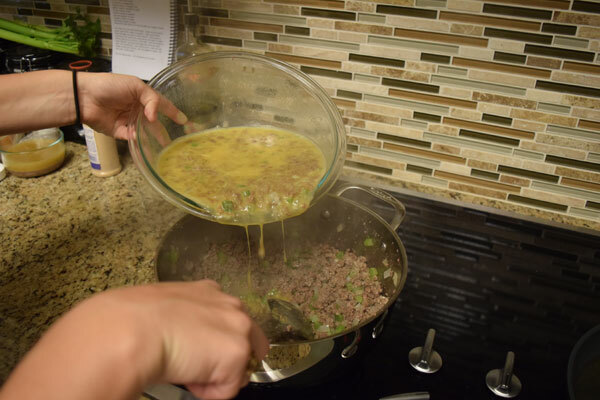 I then added the egg/beef mixture SLOWLY back into the pot, stirring the whole time. It worked like a charm, and there were no scrambled eggs! Although it doesn’t look too appealing, trust me, it’ll be delicious! You can also add the eggs slowly to the pot, stirring continuously. Add the wet bread (squeeze out excess water), 1 Tbs Garlic Pepper, 2 tsp Chicken Flavor Concentrate and 2 cups of water. You can also replace the Chicken flavor and water for two 8 oz cans of Chicken Stock. Stir together. Simmer for about 10 minutes. If the dressing is still a little too wet for your liking, add some dry bread crumbs (like Panko) to help firm it up. At this point, it’s best to do a taste test to check for seasonings. Add more to your liking. Pour your dressing into an oven safe dish and bake on 350°F for about 15 minutes, or until bubbly. You can also broil it for a few minutes to crisp up the top for a delightful crunch! Voilá! Now you have a tasty dish to add to your Thanksgiving feast! This dressing stores in the refrigerator or freezer, and makes excellent left over sandwiches. From the Bolner Family, we all hope that you have a wonderful Thanksgiving!